Roseanne Bartley extends the process of live jewellery to include the maker/participant in an amuletic devised experience. Cross Roads is an intimate project reflecting on the loss of life caused by unsafe driving. The project proposes the idea that improved road safety can be achieved by activating a localized engagement with place and community. 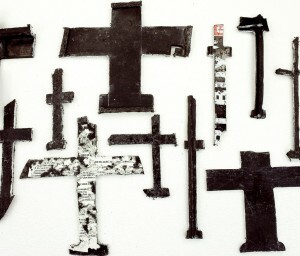 In an unconventional twist Bartley reworks the principle of the amulet by working with fragments of cars (black plastic) recovered from the roadside. She walked and worked around the major intersections and traffic hotspots in her neighbourhood, fashioning the fragments she collected into crosses of varying dimensions. Bartley acknowledges the importance of ritual in creating amuletic power. She ‘charges’ her amulets by returning the crosses to the road. At the point when a car passes, she recites a mantra committing to herself to safe car usage. One of her crosses hangs from her rear vision mirror. Bartley began to extend her process by inviting along adults, teenagers, friends and neighbours to accompany her. Guided by a set of instructions each participant created an amulet, and charged it. They were then instructed to locate their amulet in place of convenience (e.g. on their body or key ring) and to re-charge it should they discover their resolve was weakening. Acknowledging the change of energy from amulet to memento Bartley installed a sequence of crosses in the gallery space, as a site offered in remembrance of lives lost to traffic fatalities. That moment of reflection was very poignant, bringing back memories of a past loved one. The closure for me was realised in the writing. The experience was subtly disturbing but resolved.